October 2009 issue, Vol. 7, No. 8. Cover illustration by Charles Burns. The cover depicts, clockwise from the upper left, Vlad Țepeş, Fidel Castro, Agnès Varda, and Jonathan Ames. Between 2003-2015, The Believer was published by McSweeney's, the independent press founded in 1998 by Dave Eggers. Eggers designed The Believer’s original design template. Park left The Believer in 2011, with Julavits and Vida continuing to serve as editors. In 2017, the magazine found a new home, moving from McSweeney's to the Beverly Rogers, Carol C. Harter Black Mountain Institute, an international literary center at the University of Nevada, Las Vegas. The Believer is currently edited by Joshua Wolf Shenk. First published in April 2003, the literary magazine was published in San Francisco by friends who planned to "focus on writers and books we like," with a nod to "the concept of the inherent Good." The print edition was initially published monthly. From late 2007 until September 2014, the print magazine came out 9 times per year, including annual Art, Music, and Film issues that sometimes featured a CD or DVD insert or other ephemera. In 2005, it was printing about 15,000 copies of its regular issues. 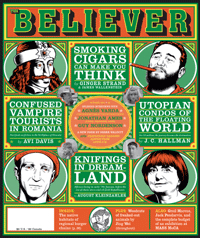 The Believer is a magazine, as its co-editor Heidi Julavits writes, that urges readers and writers to "reach beyond their usual notions of what is accessible or possible." The critic Peter Carlson praised the magazine's essays as "highbrow but delightfully bizarre." Its book reviews may assess writers of other eras and interviews with writers, artists, musicians and directors often conducted by colleagues in their fields. Ploughshares editor Don Lee called it a "utopian literary magazine. This is the sort of thing everyone dreams of – having this quality of staff on board." Writing in the New York Times, A.O. Scott described the magazine as part of "a generational struggle against laziness and cynicism, to raise once again the banners of creative enthusiasm and intellectual engagement," noting its "cosmopolitan frame of reference and an eclectic internationalism," mixing pop genres with literary theory. The magazine includes several feature essays in each issue but also draws on a stable of recurring features. Past and recurring columns include "Sedaratives," an advice column founded by Amy Sedaris that hosts a guest contributor every issue, such as Buck Henry, Eugene Mirman, and Thomas Lennon; "Stuff I've Been Reading" by Nick Hornby, a mixture of book discussion and musings; "Real Life Rock Top Ten: A Monthly Column of Everyday Culture and Found Objects," written by Greil Marcus; "What the Swedes Read", by Daniel Handler, which examines the work of Nobel Prize Winners; and "Musin's and Thinkin's," by Jack Pendarvis. All issues include a two-page, multi-color design feature called "Schema," whose theme has ranged from "Forensic Sketches of Literary Criminals" to "Habitats of Regional Burger Chains." Illustrations and cartoons are featured throughout the magazine. Until late 2014, the cover illustrations for all regular issues were done by Charles Burns, while most of the other portraits and line drawings are by Tony Millionaire (following Gilbert Hernandez from the fifth issue on). Michael Kupperman's Four-Color Comics has appeared in many issues, and in most issues a series of images from a given artist or other source run as spot illustrations throughout the articles à la The New Yorker. The Believer debuted a comics section in the 2009 Art Issue, edited by Alvin Buenaventura, that includes strips by Anders Nilsen, Lilli Carré, Simon Hanselmann and Matt Furie. These comics are exclusive to the print edition of the magazine. McSweeney's has published a number of books under The Believer Books imprint, such as Nick Hornby's The Polysyllabic Spree (2004), Housekeeping vs. The Dirt (2006), Shakespeare Wrote for Money (2008), and More Baths Less Talking (2012), collections of his "Stuff I've Been Reading" column. Other titles include Tom Bissell's Magic Hours (2012), Tamler Sommers's A Very Bad Wizard: Morality Behind the Curtain (2009), and anthologies of essays and interviews including Read Hard (2009) and Read Harder (2014), The Believer Book of Writers Talking to Writers (2008), Always Apprentices (2013), and Confidence, or the Appearance of Confidence (2014). Since 2005, the Believer Book Award is presented annually to novels and story collections the magazine's editors thought were the "strongest and most under-appreciated" of the year. A shortlist and longlist are announced, along with readers' favorites, then a final winner is selected by the magazine's editors. In 2011, the Believer Poetry Award was inaugurated using the same model. Since 2015, the editors' favorites book selections have been compiled and annotated on The Believer Logger. ^ "The Believer - Issues". The Believer. Retrieved 2017-01-30. ^ "The Believer Poetry Award". The Believer. Retrieved 18 October 2014. ^ "Our Favorite Books from 2015".